Along with the meats thrown on the barbie, no picnic is complete without the full complement of yummy side dishes, and potato salad is one of my personal favorites. I make several different potato salads, from the Southern-style one I grew up with that incorporates diced sweet pickles to a tangy mustard-dill version to an herb version that’s flavored with basil pesto and a dash of dill. I made some of the latter today and had a friend taste-test it for an objective opinion. He liked it, he really liked it (smile)! Preparation: Wash and scrub potatoes, place in pot and cover with water. Turn heat on high under pot and set timer for 20 mins. Add eggs to potatoes in pot and boil for an additional 15 mins. Turn off heat and let sit for 5 mins. Pour off hot water and add cold tap water to cover potatoes and eggs, then immediately pour off and add more cold water to cover. Let potatoes and eggs sit in water for 10 mins. to cool. Drain, let dry and then chop potatoes in chunks (no need to remove skin); peel and dice eggs. Mix mayos, pesto, honey, onion, bell pepper, dill and dry mustard, together in large bowl. Fold in potato and egg, add salt and pepper to taste, then refrigerate for at least two hours (flavor is better if you leave it overnight) and be sure to keep it in the cooler at outdoor barbecues. Enjoy! I’d love to hear how you spice up your summer picnics by making dishes using ingredients from your garden, so please leave a comment with your kitchen tips. 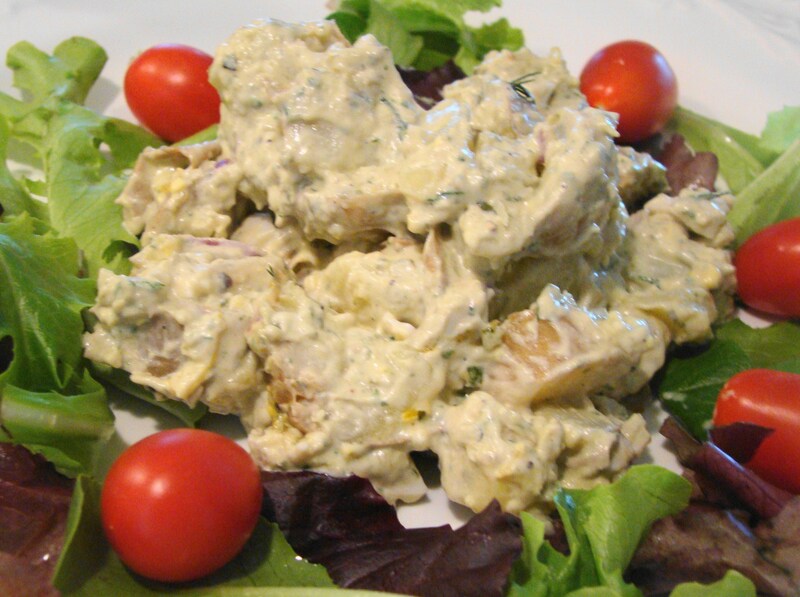 Yummy potato salad 😉 I will keep and cook this recipe for a party. I like the fact that you cook both potatoes and eggs in the same pot. Happy Memorial Day! I love potato salad too. Thanks for stopping by my blog. I had to hop over and see yours too! (-: Have a great weekend! So funny to read this post. I made potato salad yesterday for the first time since last summer! I boil my eggs & potatoes together too. I did not add anything from my garden (it’s just getting going) but it was still delicious and definitely made it feel like summer just eating it. It didn’t feel very summery outside tho ~ it’s been a cool, overcast, rainy Memorial Day for us in Colorado.